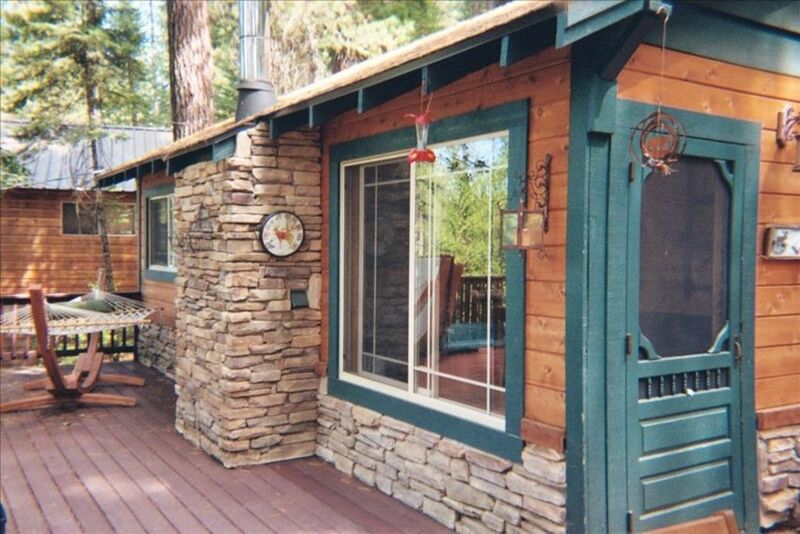 One of a kind escape bungalow in secluded Blue Lake Springs, just on the outskirts of Arnold, Ca. Amazing, one of a kind cottage with beautiful views and ambiance! Outdoor spa and large wrap around deck with breakfast nook make for an amazing relaxing vacation spot! Located on a secluded drive with a view of Fly In lake, you’ll feel like you are miles away from anyone or anything. Our cabin includes some great modern amenities, while still giving you the feeling that you’re far away from the day to day hustle and bustle of the city. Decorated in the classic style of the rustic American cabin, our getaway is decorated with knotty pine throughout. The spacious wraparound deck overlooks the lake. The outdoor spa and Brazilian Teak breakfast table (available during the spring & summer) are perfect for enjoying the solitude of the mountains. Listen to the sounds of the ducks and birds while enjoying your favorite beverage as the sun sets over the Sugar Spruce laden hills. Fly In Lake is directly across the street from the cottage. The gently sloped beach makes for a perfect swimming hole for the kids. During the evenings enjoy a view of the stars while unwinding in the heated spa. Take in the romantic summer sunsets on the deck and enjoy an outdoor meal on the beautiful teakwood dinner table. Small and cozy, the two bedroom/1 bathroom (shower only) cabin sleeps a family of four comfortably. The kids room has a bunk bed with 2 full size beds. The master bedroom has a Queen bed with a window overlooking the forest and lake. The kitchen is small but fully equipped, and includes a small stove, fridge, microwave, butcher block and coffee maker. For those who absolutely must maintain some sense of what’s going on in the real world, the cabin is equipped with wireless internet access, and a wireless Bluetooth Boombox. There is also a flatscreen TV with access to Netflix and Apple TV, as well as basic cable. Arnold is surrounded by the Stanislaus National Forest, Big Tees State Park, the Gold country of Sonora, numerous lakes and rivers, 12 wineries, 3 golf courses, Mercer Caverns and much more. You will be 5 minutes from Calaveras Big Trees State Park, 30 minutes from Bear Valley Ski Resort, 20 minutes to Stanislaus National Forest, and just 15 minutes from historic towns of Murphy's. Please be aware that while our renters currently have access to Fly In Lake, access to Snowflake Lodge in Blue Lake Springs is not currently available. HIKING, MOUNTAIN BIKING, camping & backpacking are all at your doorstep in this scenic and vast Stanislaus wilderness area. WINE TASTING with award winning wineries such as Stevenot Vineyards, Chatom Winery, Hatcher Winery, Black Sheep Vitners, Indian Rock Vineyards, Kautz Ironstone Vineyards, and Milliaire Winery. SKI/SNOWBOARD at the Sierra's 'best kept secret', Bear Valley Ski Area for downhill, cross country, and ice skating. FISHING is plentiful in one of the many lakes, streams and rivers including the Stanislaus River, Mokelumne River, Bear Creek, Rattlesnake Creek, New Melones Lake, Alpine Lake, Mosquito Lake, Union & Utica Reservoirs, New Spicer Reservoir and many others. BOATING and WATER SPORTS at one of many lakes including New Melones, Don Pedro, Hogan, Tulloch, Comanche & more. CAVING is also available at Moaning Caverns, Mercer Caverns or Cave City. Its location is perfect for a quiet weekend get-a-way or, better yet, a week’s worth of fun! AMENITIES: Wood-Burning fireplace (there is plenty of wood available) Full Kitchen, Microwave, linens, Pillows and Towels are provided, Stove, Refrigerator, Cooking Utensils, Plates, Cups, Glasses, Flatware, Gas BBQ with side burner. butcher block, small dining table, wifi, Netflix, basic cable and wireless boombox. Outdoor dining table along with lounge chairs and outdoor coffee table. Reduced rates available for 5 or more nights. Maximum of four people per stay. Additional $110 cleaning fee applies. This fee covers cleaning before and after your stay. No pets allowed at the property. Any evidence of pets will result in an additional $250 fee. I'm a white collar professional , father of two who loves to travel both for work and pleasure. I use VRBO extensively, as both a traveler and a host. I pride myself on taking very good care of my property, and also ensuring that I am available to my guests anytime they need me. I survey all of my guests, in an effort to not only ensure that I understand what they enjoyed most about their visit, but also how I can improve their experience at the cottage. I purchased the Lakeside Cottage in 2006. Over the years, I've tried to give the place the feel of a secluded, tahoe style lodge. I have several guests who return every year, from as far away as Spain. I try to continually improve the Cottage so as to ensure a great experience for my guests. There is no other property in the area that can match the view, ambiance and secluded nature of the Lakeside Cottage. The wraparound Trex deck, beautiful breakfast nook and spa overlook Fly In Lake. There is no other location in this area that provides the solitude, views and ambiance that can be enjoyed at the Lakeside Cottage. The Outdoor deck furniture provides for a great view of the surrounding scenery and gorgeous sunsets! Filtered view of Fly In Lake from the large Trex deck. Lake is directly across the street from the cabin. Great views of the nearby hills, fantastic sunsets to be seen while relaxing on the deck or in the spa. No central heating but several space heaters are available. Hi speed internet access available throughout the cabin and on the deck. Dining table can seat up to 4. Two additional chairs are available in storage shed. Kayaking and canoeing are permitted in Fly In Lake. The hot tub is available year round for our guests. Large Trex deck with covered breakfast nook overlooking Fly In Lake. Great place to relax and unwind! The place was great. Had snow on the ground and that made it even more fun. Drive way is a challenge with the snow but should be fine in dry weather. The spa and fireplace were the high lights for us. The shower is a little small but the fresh water was so refreshing! We cooked there and they have everything there for you to use. There is also a nice propane bbq. Will be returning to this one! Quaint cabin - perfect for the two of us. Good location, great hot tub! When they say the driveway is steep that is no understatement- a little nerve racking getting up and down it since it was snowing and raining and we had a four wheel drive. Very narrow driveway. Parking a challenge. No alternative place to park except on the steep driveway even if we were willing to walk a bit. Great place to get some R&R! The only reason that I couldn't put 5 stars is that it seems that there is a lot expected of you when you have paid a high cleaning fee. Like: IF you use the beach towels, launder them, and put them away before you leave, wash and put away all dishes used, start the wash of any linens used, and TAKE YOUR GARBAGE WITH YOU, that one, I've never been asked to do, and I've rented many times from VRBO. If a cleaning person is coming in soon after you check out, they should be able to take the garbage. The check out time is not clear, on one place it says 10 am , on another it says 11. I texted and we got 11 , which was very nice. Maybe some of the information needs to be updated, the notes say that you can enjoy DVD's , but there's no DVD player, and I didn't see any information that we needed to bring one. The driveway is easily navigated by progressing slowly up the driveway, if you speed to quickly up the driveway, you will bottom out. there's also parking on the street. We do not have a DVD player, there's no DVD availability noted within the listing. We do offer a Smart TV with Netflix, Hulu and many other apps. As we are located in the forest, and wildlife is abundant in the area, we do ask that guests take their refuse with them. We can also take refuse to the local weigh station (just a few miles away) for a small additional fee. The cabin was a perfect way to spend New Years. We had some great peaceful evenings enjoying the tranquility of Arnold in the hot tub out on the deck. The fireplace ensured that we had the full "cabin in the woods" experience. I enjoyed chopping wood from the stocked shed to keep our fire going. Even though the cabin was a bit smaller than we originally thought, it's size made it easy to keep the place nice and warm. We used the bluetooth speaker extensively, it was a really nice touch. Cooking was a little tricky as some of the text on the stove knobs were illegible from use. Other than that, it was a great place to spend a few days away from the city. As of June 2018, we've installed a brand new stove!! What a darling cabin in the woods. Every need has been thought of by the owners and the peace and quiet is wonderful. Beautiful family get away! Only catch for late fall, the lake is empty. Didn’t take away from our fun though. Wine tasting in nearby Murphy's. Bear Valley ski resort is about 30-40 minutes east of the cabin. Excellent hiking throughout the area, including Calaveras State Park. Kayaking, snow skiing and cross country skiing nearby. Nightly rates for the holidays (Christmas, 4th of July, Labor Day, Thanksgiving) are $225. $50 cancellation processing fee applies for all cancellations.